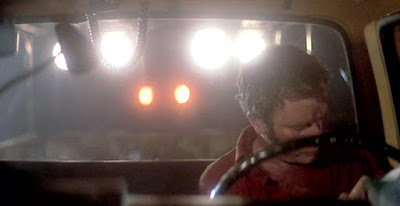 Close Encounters of the Third Kind is an amazing and fascinating film. Normally, I don’t review films that have been written about this much, but this time I think it’s worth it. Close Encounters is the film I think of when people talk about the 1970’s film renaissance, when I think of Spielberg’s real talent, and when I think of films done right. This is a film you should see and appreciate. 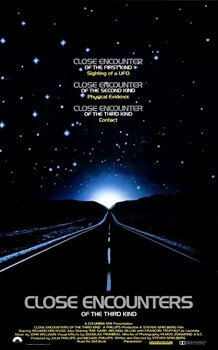 Close Encounters involves the convergence of two separate but related stories. The first story unfolds in small vignettes that take their time to explain what is going on. In the first vignettes, a group of men race through the desert to find a collection of World War II era fighter craft, Grumman Avengers, in pristine condition. We don’t know this yet but these are the planes belonging to the doomed Flight 19 which vanished without a trace off of Florida. In the second, the same men find a ship, the SS Cotopaxi (which sank on her way to Cuba), in the sand dunes of the Gobi desert. In the third, an air traffic controller hears two planes report seeing UFOs flying near them. In the forth, the men are in India, where they seek villagers who claim to have seen something in the sky. These villagers provide the men with a series of musical tones which the men conclude are a form of communication. Each of these vignettes builds the puzzle and brings us to the conclusion that aliens are seeking to communicate with the human race and they have chosen Devil’s Tower, Wyoming as their place of contact. 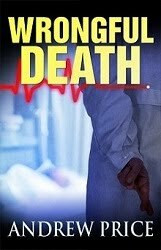 The second story, which is interspersed between these vignettes, involves Richard Dreyfuss as Roy Neary, an electrical lineman from Indiana. Roy is out looking to fix a downed wire when he has a close encounter which sunburns half his face. This piques his interest and he starts to investigate UFOs. 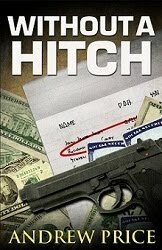 In the process, he meets a single mother named Jillian, who also has had a close encounter. Her son will be kidnapped by the aliens while she is in the house. As Roy investigates, he becomes increasingly erratic in his behavior. This causes his wife to take their three children and leave him. The specific event that causes her to leave is when Roy starts dumping garbage in their living room so he can build a life-size model of Devil’s Tower. He feels compelled to do this even though he doesn’t even know that it’s Devil’s Tower until he sees a report on the news that the military is evacuating the Devil’s Tower area because of a supposed nerve gas spill. Roy is drawn to the area and, believing the military story to be false, he makes his way there. At the foot of Devil’s Tower, the two stories converge as Roy is picked up trying to sneak into the area. There the men from the vignettes question him and try to send him away. But Roy escapes and reunites with Jillian, who also has been drawn here. They make their way up the mountain until they find the secret landing base the government constructed. Soon enough, the aliens arrive. Close Encounters is an awesome movie. It’s beautiful shot. It’s incredible well written. You really care about these characters. The plot is engaging. The mystery of what is going on is fascinating the first time through and still engaging even when you know how it will turn out. The movie has iconic music and sounds. It has amazing special effects too, blowing away those of today. The movie is historically interesting too. For one thing, this film allowed science fiction to grow up. Before this, science fiction was about spaceships and laser guns and battling aliens. This was the first film that foreswore that and said that science fiction could be a character drama about how we finally make contact with an alien race. Indeed, the film’s view of realistic aliens as peaceful is essentially groundbreaking. It’s also historically interesting because of the way it influenced UFO believers. Before this film, UFO abductees all over the world reported seeing very different aliens. But after this film, they all saw the small gray eunuchs with large heads and large eyes. So in a way, this film unified the UFO story, which has made the industry stronger... even though it should be discrediting. Anyway, what makes this film so fantastic is the way Spielberg handled it. This was probably the film that cemented Spielberg’s empire, coming on the heels of Jaws and being a world wide mega-hit, and the reason why is that Spielberg was at the top of his game. This was Spielberg before he succumbed to commercialism and before he started using shortcuts to generate emotion. This was Spielberg when he took his time and told the story as it should be told. What Spielberg did so well can be seen in the characters. First, and most importantly, he takes his time. Spielberg never rushes. This is so rare in modern cinema, where every second that can be removed from a film is for various reasons. Secondly, there are no villains. Some want to see the military as villains, but they aren’t. The military chases everyone out of Wyoming and tries to keep Roy and Jillian from getting up the mountain because they want to avoid a chaotic first contact. Notice that they never use violence to stop these people, and there are no armed soldiers or weapons at the landing site. Doing a film without a villain is a rare achievement in modern cinema because it is harder to write conflict without a villain. The real key, however, is in the wide array of characters who get solid screen time. Roy is the everyman skilled laborer. His wife (Terri Garr) is the frustrated wife. Jillian is the overwhelmed single mom. David Laughlin (Bob Balaban) is a cartographer who is enlisted in the search for clues because he can translate French into English. Claude Lacombe (Francois Truffaut) is a French scientist and specialist in UFOs who leads the search for clues. Other prominent characters include an Air Force officer assigned to Project Blue Book, the Army commander in charge of clearing out Wyoming, air traffic controllers and the pilots to whom they speak, police, co-workers of Roy, Roy’s kids, a UFO crank, the men in charge of communicating with the aliens, and so on. Each of these characters feels real to us because we learn tons about them. In fact, we know more about them than we know about the lead characters in most modern films, and that makes the film feel real. What's more, Spielberg gives us this wealth of information in only a few clever moments or lines of dialog. Consider Roy’s wife Ronnie. She seems like a loving wife on the surface, but we quickly see that she’s rather lazy, from her wardrobe, and she’s more concerned with appearances than with Roy’s problems as she tries to hide his sunburn and get him to stop talking about it. And, most tellingly, she blows up at Roy at the very moment where he asks her for emotional help. This tells us so much about her and it explains why Roy acts so erratically. As an aside, she would not exist in a modern remake except as an off-screen ex-wife. Now take Laughlin, who is a sort of narrator for the vignettes. He never tells us anything about his life, except that he was a cartographer who also speaks French. But we soon learn that he’s rather meek, that he’s amazed by what he’s seeing and wants to believe, that he’s a kind man, that he never once worries that the aliens might be a danger, and that he’s rather bright. We learn this in an intensely clever scene where he solves the key mystery. 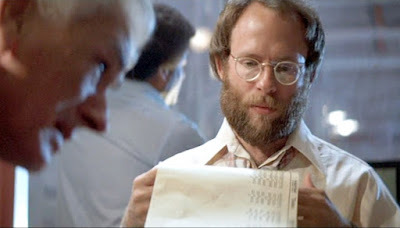 In this scene, Laughlin realizes that the signals sent by the aliens represent coordinates on a map. In most movies, he would blurt this out and the scene would end. But Spielberg doesn’t do this. Instead, we see Laughlin figure it out. He takes a moment to be sure of what he thinks he’s found. Then, rather than slamming this in the faces of the supposed geniuses who are debating all around him, he politely turns and says, “excuse me.” Then he humbly explains his conclusion. And then, having solved the key mystery, he goes right back to being a simple interpreter. This tells us so much about his character. And again, this is exactly the kind of character films no longer use because they want the main character to handle everything and they don’t care about letting you get to know the minor characters. In fact, while we are talking about that scene, I think the brilliance of that entire scene deserves mention, as Spielberg converts a scene involving men talking into an action scene. He does this by having all the characters talking over each other and moving their arms around, which gives the impression of motion. Then, rather than grabbing a map, they find an enormous globe, which they free from its holder rather than carry back to their room and they let it roll toward the camera as they chase it. Again, this gives a sense of motion and urgency, and strangely it makes the audience tense as they wait to see if the men can catch the globe, just as it's tense waiting to see if Laughlin can interrupt them to be heard - in a similar moment, Roy is distracted by his wife as the television shows Devil's Tower in the background and it feels very tense as you wait to see if he will turn around in time to see it. Finally, rather than just finding the spot on the map, we watch two fingers trace the longitude and latitude lines until they connect, giving the audience a feeling of a race and a treasure being found, and then suddenly the room explodes in voices again. The end result is that a scene which essentially only involves some men pondering the meaning of some numbers and looking it up on the map, turns into an action scene with a dramatic punch. Spielberg does this throughout the movie. This is what Spielberg used to do so well and which so few others ever managed to copy - make boring moments into heart-pounding scenes filled with real characters. Sadly, no one does this today. This is why this film is so amazing. As an aside, notice that the rolling globe and the tracing of lines will appear again in Raiders of the Lost Ark. I love this movie. I remember watching it for the first time in 7th grade - the teacher purposely started the tape after the main titles, though I pretty much figured out what it was in no time, despite not knowing much about it. I also think this film has one of the best first acts of any movie, period. The musical “jump” at the beginning, the mystery of the planes, the mystery of the kid and the mess in the house, the mystery in the air traffic control center, and finally, Roy’s close encounter. It’s perfectly paced and we get just enough information to keep us interested. It’s wonderful. I’ll admit the second act slows down for me, just a little bit, but it’s all a preamble for the climax. I wish more films like this utilized a wide array of characters. Sure, a movie like Transformers might have a wide variety of characters, but they’re not really memorable. Or they’re cannon fodder. Or they’re one-and-done comic relief. The people in this movie feel like real people with real jobs, even though we may not know their names or anything else about them. I said the same thing in my Jack Ryan review about The Hunt for Red October - there are about a dozen memorable characters in the latter and next to none in the former. One more note about the map scene - sadly, that scene would all be done on a computer today, with some hacker in front of a monitor. No globe, no action. By the way, I had a thought when I recently watched Interstellar. I'm beginning to hate when movies have their characters explicitly state the theme of the film out loud. McConaughey has a line early in the film where he's telling his daughter about the scientific method and it's all rather on the nose, about how we don't know everything, how we need to test a hypothesis, etc. One of my favorite scenes is the mashed potato scene. It was funny, symbolic, mysterious, and showed Roy's obsession to learn the truth about what was happening to him, and what was compelling him at a subliminal level. Who knew mashed potatoes could be so interesting? You know it's a great film when there are so many memorable scenes and characters. Plus, there are no fillers or wasted scenes. Every character arc is seamlessly woven into a rich tapestry of storytelling at it's finest. ScottDS, I hate that to. It seems to be a recurring side effect of the modern culture of impatience. Patience is a virtue for a very good reason. Scott, It's fascinating to see parts of Raiders in this, isn't it? I agree, films need to start using more characters. All the great and memorable films are packed with minor characters that you get to know and understand. 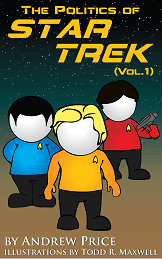 Today, on the other hand, you barely get to know the main character and his posse. It's super rare that you get to see anything more than a few cardboard extras who come in and deliver a plot point and then leave or get shot. One notable exception is Guardians of the Galaxy which I really enjoyed for that very reason. Sadly, that's true about the globe. You would see the main character or his hacker buddy cosy up to the computer, type in "Secret Meaning of Alien Numbers" in "Generic Search Engine" and then the answer would pop up. Boring. Agreed about characters stating the theme of the movie. That feels like they think the audience is stupid. You don't see that in this film. Instead, you get clever ways of saying things, e.g. "The aliens must be smart" is said as "Einstein was probably one of them!" Clever lines are very rare today, but this film is packed with them. Thanks Ben! This film is PACKED with memorable moments! I love the mashed potato scene. Think about what it does. It starts as just them eating dinner... then he starts to act strangely... then he starts playing with the mashed potatoes, you have no idea why... soon you see him shaping them, and everyone freaks out. This tells you that (1) recognizing the shape of the mountain is almost instinctive, (2) it highlights how strange he is acting and why his wife is worried, (3) it foreshadows the mountain he builds, and (4) it shows you that his subconscious mind is obsessed with figuring out what this shape is. That is a lot to convey without really any words. That's amazing directing. That's why Spielberg was so awesome at this point in his career. I was nine years-old when my grandpa took me to see this. Still reeling with Star Wars, this movie seeped into my brain and has stayed there. Perfectly written, brilliantly directed and exceptionally acted, this film had a sense of wonder and mystery that makes it timeless. My grandpa wasn't a big science fiction fan, until this movie. I remember him telling me how Flash Gordon just looked silly and he actually called 2001 "pretentious." But he sure loved Close Encounters of the Third Kind. He took me to see it anytime I asked. Indeed, my entire family loved this movie, and it was the only thing at the time everyone had in common. Being 9, the scene that really hit home was the alien abduction scene. My brain could not compute the boy was not afraid but the mother was terrified. As a kid I had never seen anything quite like it. As an adult I appreciate the wonderful, positive science fiction story in this movie. It is part of my science fiction writer brain; beyond the atmosphere lies hope, mystery and wonder. This film absolutely has "a sense of wonder and mystery that makes it timeless." That is absolutely true, and this is what is so brilliant here. You see this movie and you find yourself wondering what is out there waiting for us... what mysteries are there to uncover, what beautiful sights to see, what friends to make, what better future! That alone makes this movie stand out compared to all the science fiction that is just about fighting aliens. And that's long before you add in the rest -- the great writing, the beautiful imagery, the creative direction, and the stellar acting. This is an amazing movie and I wish more science fiction films today tried to emulate it rather than just being action films in space or finger-wagging political pieces. A big reason why Star Wars and CEOTK were such cultural phenomenons was that they contrasted so sharply with the pessimistic mood of the 1970s. At the start of 1977, the popular culture was in a collective funk. Paul Ehrlic was predicting mass starvation, oil seemed to be running out, the US just lost a war, and Jimmy Carter was bemoaning the country's collective malaise. Meanwhile Hollywood was busy churning out dystopian films like Soylent Green and the Planet of the Apes sequels. It's hard to explain to the younger generation just how revolutionary Star Wars and Close Encounters really were at the time. For those of us who grew up in the 1970s, these wonderful films full of optimism and hope popped up seemingly out of nowhere at just the right time. Willow, That is really true. I remember talking about the Presidency being too big for one man, waiting in line for gas, and Hollywood turning out films like Soylent or Saturday Night Fever and shows like Barney Miller where the characters seem to be waiting around for everything to just kind of end. Star War and Close Encounters were so different, so positive, so alive, so hopeful that you couldn't help but feel like a brighter future was just around the corner. These movies were exciting, fun, and they sent you home with a big smile and sense that the future would be better. And that made them really stand out. Kenn, I wondered that too after we mentioned it. That would be absolutely hilarious if Spielberg and Lucas laid the groundwork for Reagan! LOL! On the other hand, I need to say that positivity pretty much sells at all times and Reagan knew that. Yeah - we need to remember that little bit of wisdom - especially going into 2016. Anyway - great review! One of my favorite films. Always loved the look of the U.F.O.s - thanks to the team that would go on to do "Blade Runner." (Lots of similarities in the looks.) They even used a part from the CE3K special edition mother ship interior for the top to the police precinct in "Blade Runner." I agreed. That is something we definitely need to remember. Happiness sells, anger doesn't. I love the mothership too. It's recognizable but still mysterious, obviously advanced, but you can't say how. It's beautiful too. In my opinion, this is Spielberg's best film. Which version did you watch for this review? There are three cuts of this film, the 1977 version, the 1980 Special Edition, and the 1998 Director's Cut which is Spielberg's preferred version. As the story goes, he didn't have enough time to fine-tune the film in 1977 but the studio allowed him to do so in 1980, as long as he added the mothership interior scene, which he hated. But that was the price of admission. The 1998 cut is pretty much the best of both worlds, minus the mothership ending. P.S. Here's a great article on the film from one of my favorite movie websites. Scott, I prefer the 1977 edition, but I've seen them all so they all kind of blend together. I personally find the extended mothership stuff to detract from the film. Shawn, I agree. This is an amazing film and none of his others quite come up to this level.